Product #22152 | SKU TS32GCF1000 | 0.0 (no ratings yet) Thanks for your rating! 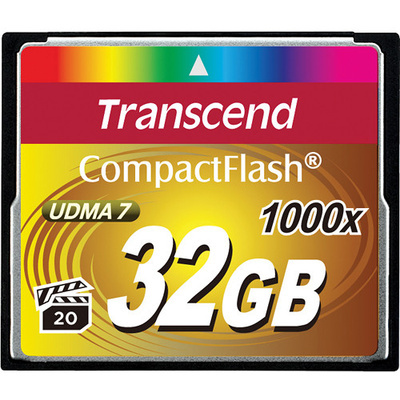 The Transcend 32GB CompactFlash Memory Card Ultimate 1000x UDMA is a CF Type I memory device with a data storage capacity of 32GB. It harnesses UDMA 7 technology to achieve a 1000x speed rating, enabling maximum read speeds of 160MB/s and write speeds of 120MB/s. The CF card supports VPG-20 for capturing professional-quality, full HD movies at up to 20MB/s. When paired with a UDMA 7 enabled reader (not included), the card offers super-fast file transfer to computer, drastically accelerating your workflow. It's also backed by a limited lifetime warranty.